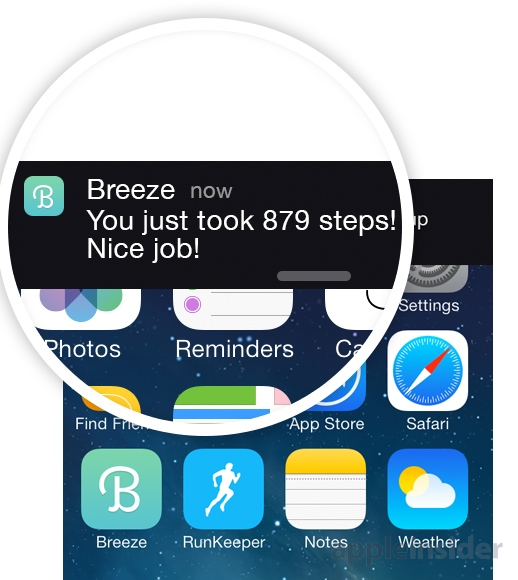 RunKeeper on Thursday launched Breeze, its new step tracking app that harnesses the abilities of the M7 chip found in Apple's iPhone 5s. AppleInsider was given an early hands-on with Breeze, and found it's a great way to track activity from the rest of the day, when you're not out for a run. 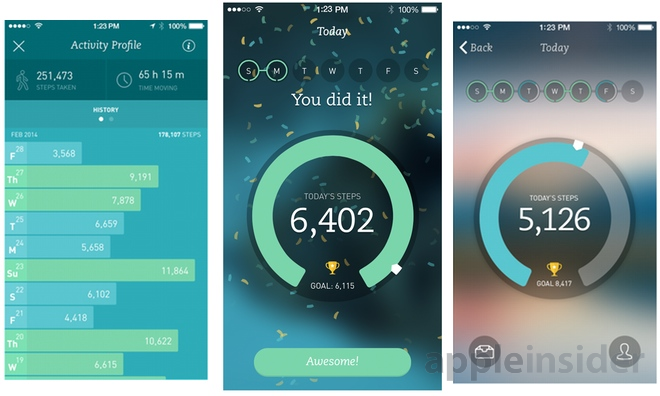 RunKeeper is best known for its eponymous iOS application, which offers advanced data for runners. But the Boston-based company is now expanding its portfolio with Thursday's launch of Breeze, which it bills as far more advanced than a traditional pedometer. 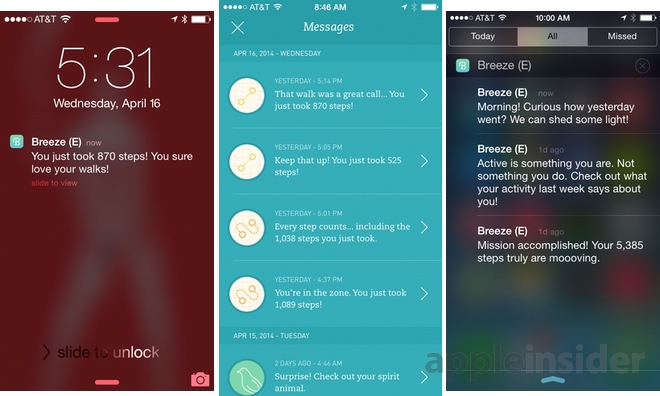 Leveraging the power of the M7 chip, which constantly tracks motion in the background of the iPhone 5s, Breeze offers what RunKeeper calls "personal coaching" in the form of notifications and updates throughout the day. By presenting "subtle yet persuasive suggestions," Breeze is designed to get users moving, get them in shape, and help them lose weight. Breeze is said to track context around the user's behavior, delivering notifications on long walks and highlighting specific points in the day where users are at their best. The next morning, Breeze offers a summary of the previous day's activities, and users can quickly view their past stats. 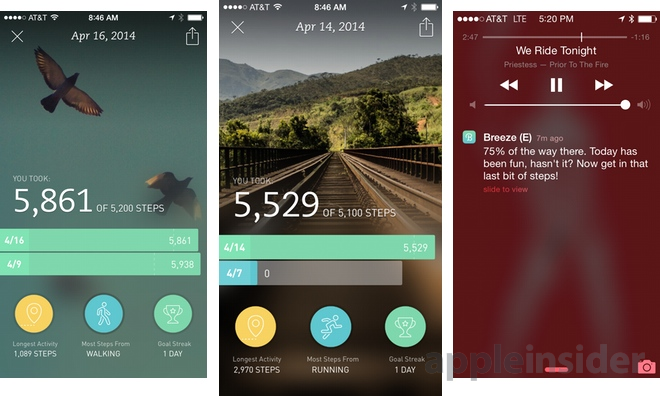 We've had the opportunity to test a pre-release version of Breeze on our iPhone 5s for a few days, and we found it to be a unique addition to the existing fitness tracking landscape. The notifications were indeed helpful, and dynamic goals were set for each day based on our past levels of activity. That said, Breeze is a little too encouraging at the moment. We went on a jog using an iPhone 5s on our arm, which was running the preexisting RunKeeper app. All the while, Breeze was still checking our stats in the background. As we ran, the RunKeeper app displayed current time and pace on our Pebble watch. But the iPhone 5s on our arm and the Pebble on our wrist kept kept buzzing and displaying notifications from Breeze—the step-tracking app was excited that we were finally getting our step count up for the day. It would be nice if Breeze could understand to pipe down during a run. And this feature may in fact be in the works, as the developers have promised that integration between Breeze and RunKeeper is coming. While step tracking is accurate based our tests, mapping data in Breeze is off. In one day of tracking, the app correctly showed our 1,000-step walk to the store, but did not recognize or map our actual longest activity of the day, when we were out for a two-mile run. Other than those issues, we like Breeze. When you're simply working and sitting at a desk during the day, the notifications can serve as a nice reminder to get moving, or as encouragement to keep going when you're on a walk. We're also excited to see where RunKeeper takes Breeze in the future, as we see potential for more with custom goals and achievements. RunKeeper has said it's planning more device support for Breeze, as the application is currently exclusive to the iPhone 5s, Apple's only handset with the M7 motion detector. The company has also promised that a more personalized experience in on the way, with features and notifications that will be more helpful and specific to the user's life. Breeze is now available as a free download on the iOS App Store as a 30-megabyte download.